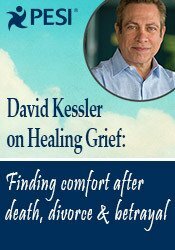 David Kessler, is one of the world’s foremost experts on healing and loss. His experience with thousands of people on the edge of life and death has taught him the secrets to living a happy and fulfilled life. He is the author of five bestselling books and the popular Healing Grief Card Deck: 55 Practices to Find Peace (PESI, 2016). 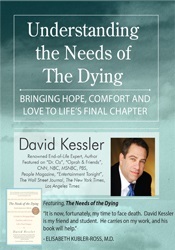 His first book, The Needs of the Dying (HarperCollins, 2007), a #1 best-selling hospice book, received praise by Mother Teresa. He co-authored two bestsellers with the legendary Elisabeth Kübler-Ross: On Grief and Grieving (Scribner, 2014) and Life Lessons (Scribner, 2014). 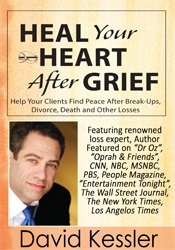 He also co-authored the book, You Can Heal Your Heart: Finding Peace After Breakup, Divorce or Death (Hay House, 2015), with Louise Hay. He worked with Elizabeth Taylor, Jamie Lee Curtis, and Marianne Williamson when their loved ones faced life-challenging illnesses. He also worked with late actors Anthony Perkins and Michael Landon. David’s work has been discussed in the Los Angeles Times, Business Week and Life Magazine, and has been featured on CNN-Cross Fire, NBC, Fox, PBS, Dr. Oz and Entertainment Tonight. David is a contributing writer on Oprah.com, Dr. Oz’s Sharecare.com, Anderson Cooper 360 and The Huffington Post. David has a master’s degree in Health Care Bioethics from Loyola Marymount University, he did his undergraduate work at University of Southern California and is a member of the American College of Healthcare Executives. He is a certified AMA/EPEC (Education for Physicians) trainer. He also is the founding chairperson for the Hospital Association of Southern California Palliative Care Committee and spent the last decade as a C-suite executive in a 650 bed – three hospital system in Los Angeles County. Financial: David Kessler is president of David Kessler, Inc. He is an author for Simon & Schuster – New York and receives royalties. Mr. Kessler receives a speaking honorarium from PESI, Inc. Non-financial: David Kessler has no relevant non-financial relationship to disclose.